President Barack Obama's 2011 budget request has effectively shut down NASA?s five-year effort to return astronauts to the moon, leaving the U.S. space agency with lofty goals — but no firm deadlines — to once again send humans beyond Earth orbit. The budget request, released today, would scrap NASA's Constellation program to build the Orion spacecraft and Ares rockets for new manned moon missions — a $9 billion investment to date. The request calls for $19 billion in funding for NASA in 2011, a slight increase from the $18.3 billion it spent in 2010. The request does, however, pledge extra funding to extend the life of the International Space Station through at least 2020 and offers $6 billion over five years to support commercially built spaceships to launch NASA astronauts into space. The space agency's three remaining space shuttles are due to retire later this year. The budget announcement occurred on the seventh anniversary of NASA's Columbia shuttle disaster on Feb. 1, 2003, in which seven astronauts were killed during re-entry due to wing heat shield damage. It came just days after the 24th anniversary of the Challenger shuttle accident that killed seven astronauts on Jan. 28, 1986. NASA Administrator Charles Bolden, a former space shuttle commander, said that while the budget cancels the program building the agency's space shuttle replacement — the Orion crew vehicle — it is not trading away safety to embrace new, privately built spaceships to fly astronauts. It also paves the way for a "21st Century space program," he said. "No one cares about safety more than I. I flew on the space shuttle four times. I lost friends in the two space shuttle tragedies. So I give you my word these vehicles will be safe," Bolden said. "They will fulfill a critical NASA need, spur industrial innovation, and free up NASA to do the bold, forward-leaning work that we need to do to explore beyond Earth." Bolden said NASA has already made new agreements with several commercial spaceflight companies to spur their efforts. NASA and the White House Office of Science and Technology plan to make an announcement related to commercial spaceflight providers on Tuesday, NASA officials said. "This new path is a big change. I realize that," Bolden told reporters in a teleconference. "But it is not a change from the guiding principles of NASA. It makes America stronger. It enables us to draw more strongly on the ingenuity of the commercial sector and create deeper ties with our international partners." The new plan is not without its opponents, particularly in states that have traditionally been home to major NASA efforts. "This is a crippling blow to America's human spaceflight program," said Congressman Pete Olson (R-Texas). "It has taken over 50 years to build and develop America's ascension to its rightful place as the dominant player in human spaceflight. That dominance is apparently no longer desired." Texas is home to NASA's Johnson Space Center, where astronauts train for space missions and the Mission Controls for the shuttle fleet and International Space Station are headquartered. Announced in 2005, NASA's Constellation program aimed at retiring the space shuttle fleet this year and replacing it with new capsule-based vehicles (called Orion) designed to launch on Ares I rockets, with a larger heavy-lift rocket called Ares V launching lunar landers and rocket stages needed for moon-bound missions. The moon plan, announced by former President George W. Bush in 2004, was aimed at returning astronauts to the moon by 2020. It would cost $100 billion, roughly the current price tag of the International Space Station. Cancelling the program will cost more than $2 billion in closing costs, NASA officials said. Last year, an independent committee led by former Lockheed Martin CEO Norman Augustine reviewed NASA's moon plan and found it hobbled by severe underfunding and delays. NASA wouldn't make it back to the moon until 2028, and even then wouldn?t have money to build the lander to set down on it, the committee found. The committee submitted several options for the president, which included embracing commercially built spacecraft and pushing aside NASA's current spaceflight plan for bolder expeditions to the moon, asteroids or Mars. "The plan released with the President?s FY 2011 budget does appear to respond to the primary concerns highlighted in our committee's report," Augustine said in a statement. Lori Garver, NASA's deputy administrator, told reporters today that the new budget request provides an overhaul of NASA's spaceflight exploration plan. 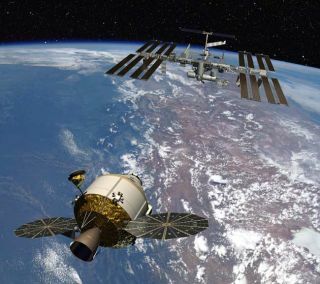 The request would set aside $369 million for vital technology development and test programs, with $183 million earmarked to support the International Space Station through 2020. The station was slated to be decommissioned in 2016, a year before the Augustine committee believed NASA?s new Orion ship would be ready to ferry astronauts to it. The new budget would set aside $3.1 billion in funding to develop better heavy-lift rockets and more advanced space propulsion technology to explore faster and farther out into the solar system, NASA officials said. ?What this program does is give us back the solar system,? Garver said. Garver and Bolden did not announce details for new vehicles, specific destinations or potential timetables for new manned missions beyond low-Earth orbit. But Garver did say that, if NASA's 2011 budget is approved, the agency could accomplish those goals well before the 2028 timeframe proposed by the Augustine committee. The agency is hoping commercially built space ferries could be ready to fly astronauts by 2016, she added. President Obama's 2011 budget request for NASA also spotlights other areas within the space agency that have suffered in recent years due to the agency's focus on human spaceflight. The request includes $170 million to replace NASA?s lost Orbiting Carbon Observatory, a probe aimed at studying climate change, which was destroyed during a launch failure last year. About $3.2 billion is set aside for science research grants and missions, including a potential successor to the Hubble Space Telescope. About $146 million — a $20 million increase — is allocated in the 2011 budget request to support education and public outreach. It is aimed at spurring interest in science, technology, mathematics and space among the American youth and general public, Garver said. "There are so many wonderful things that can be done with NASA," Garver said. "It is the people's program and we're giving it back to them." Poll: Should the Moon Be Humanity's Next Step Into Space?